THE FINANCE MINISTER revealed this morning that the government has hired Goldman Sachs to advise it on how to “optimise the return on AIB, where more than €20 billion of taxpayers’ money has been invested”. The investment banking firm is providing the advice on a pro-bono basis. In an opinion piece in today’s Irish Times, Michael Noonan says his strategy to recoup taxpayers’ money – €64.1 billion to be exact – used to bail out Ireland’s banks is working. Of that sum, €34.7 billion was poured into Anglo Irish Bank and Irish Nationwide Building Society, both now defunct. The remainder – €29.4 billion – was shared between AIB, Bank of Ireland and Permanent TSB. As of the last day of 2014, the State’s stake in AIB was valued at €11.7 billion and the 14% equity interest in Bank of Ireland was valued at €1.4 billion, according to Noonan. A number of contingent convertible capital notes (CoCos) in AIB and Permanent TSB bring the current value of the investment to just over €15 billion. Noonan admitted that Permanent TSB is not as “far along the road to recovery” as AIB and Bank of Ireland but insisted it has a “viable” plan. His department, however, will focus on AIB this year. “Given the scale of the State’s investment – some €20.8 billion – and the range of options available to recoup value from the bank, officials within my department are working with AIB to reconfigure the capital structure,” he writes. Goldman Sachs International has been appointed to provide financial advice. The Minister, who took the opportunity to remind readers that the bailout was the result of a Fianna Fáil decision, was tight-lipped on specifics in relation to AIB but said that “all options remain on the table”. Speaking on Morning Ireland, junior minister Simon Harris said the government expects to recoup “every single cent”, noting that it is a significant announcement. 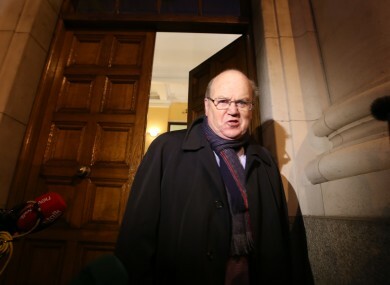 He said he was “eager to point” out that the opinion piece was not written because of an impending election, noting that Fine Gael predicts Ireland will go to the polls in 15 or 16 months time. Asked about the Anglo and Irish Nationwide investment, Harris passed the buck back to the previous government, telling the presenter that his government had not put any money in to the failed institutions. On the appointment of Goldman Sachs, Harris said it would be “very hard” to find a firm that didn’t have problems during the financial crisis. Following questions from the media, the Finance Department issued a statement outlining how Goldman Sachs won a mini-tendering process. “All members of Lot 1 were invited to tender and submit a written presentation covering their credentials, team members for the assignment and various questions relevant to AIB along with a fee proposal,” the statement continued. It is understood that all firms which tendered for the job said they would complete the tasks on a pro-bono basis. The advice given is the first step in a two-step process. There will be a separate tender if there is a decision made to sell the stake in AIB. Opinion: Enda and Co have done a great thing for the Irish people – they have made us aware. Email “Michael Noonan is pretty confident we'll get the bank bailout cash back”. Feedback on “Michael Noonan is pretty confident we'll get the bank bailout cash back”.